Relatively few poets appear in the pages of The New York Times. So the good news for Kevin Young and those of us who follow his writings and reception was that his works were featured in the NYT at least ten times over the last year. None of the coverage focused on Young's individual volumes of poetry, which might not be such good news for the many poets who only write single-authored collections of verse. In the "Diner's Journal" section of the paper on March 8, Jeff Gordiner wrote a piece "Poems That Make You Hungry" about Young's forthcoming anthology about food poems. In March, Dwight Garner reviewed Young's scholarly book The Grey Album. In April, the book was reviewed again, this time by David Shields. At the end of April, Young's book was highlighted as an Editor's Choice selection for the Times. On October 11, Garner reviewed The Collected Poems of Lucille Clifton, 1965 - 2010, which Young co-edited with Michael S. Glaser. On October 21, Garner reviewed The Hungry Ear: Poems of Food & Drink edited by Young. On November 15, the editors ran a short piece noting Young's interests and announcing that he had an upcoming review in the newspaper. On November 16, the NYT published Young's review of Darkest America: Black Minstrelsy From Slavery to Hip-Hop by Yuval Taylor and Jake Austen. Also, on November 16, Garner included Young's anthology The Hungry Ear in a list of "Best Bathroom Books of 2012." 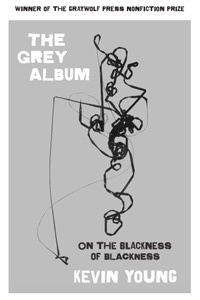 Later in November, The Grey Album was included in the Times's "100 Notable Books of 2012." Not a bad year, especially given African American poets rarely appear in the paper on a regular basis.